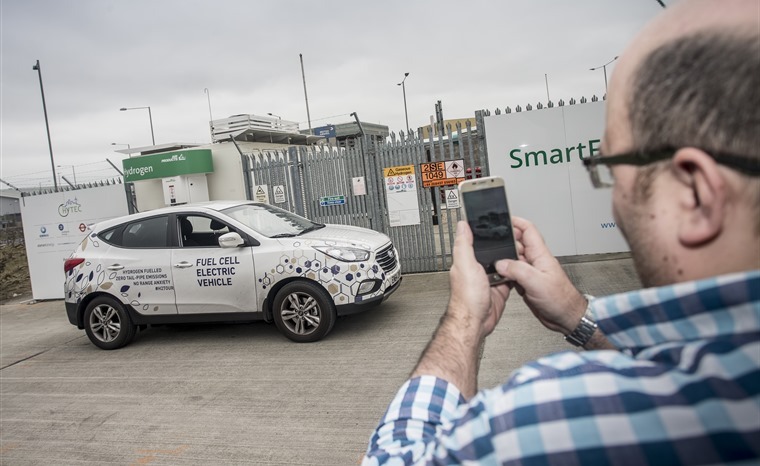 A lap of the M25 isn’t something many people would voluntarily take on, but when you’re asked to play a part in the longest ever continuous journey for a hydrogen-fuelled vehicle, you could understand why I was a little more willing than most. 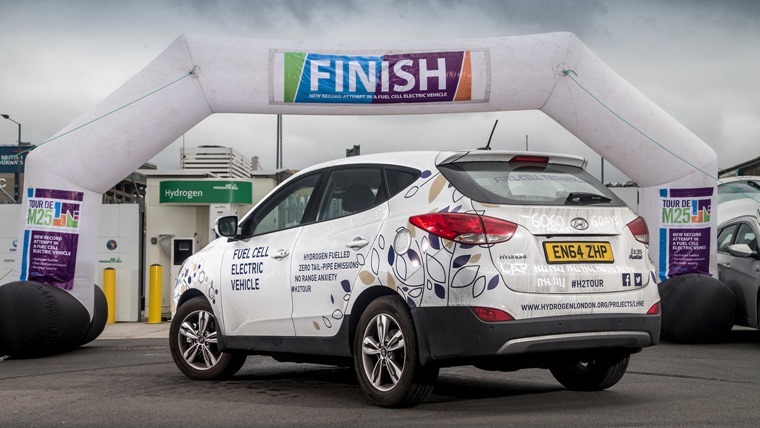 The new record was being attempted by Hyundai, which hoped to take their ix35 FCEV on a 6,024-mile journey, stopping only to top-up on fuel. My own personal contribution was just 129 miles, but it was enough to realise the possibilities of hydrogen power. It wasn’t the first time I’d driven a hydrogen car, although I’ve always been restricted on just how far I could drive them. That’s thanks to the biggest problem with the fuel – an almost complete lack of filling stations. Back in 2012, I got the keys to a Honda FCX Clarity, but wasn’t allowed to cover more than four miles. Four. Another time, I managed ten miles in Hyundai’s ix35 FCEV. This time though, Hyundai had sole use of Air Products’ pump near Heathrow Airport, so running out of gas wasn’t an issue. I was getting into the ix35 FCEV again, that - at first glance - is indistinguishable from the ‘normal’ petrol and diesel version. It’s an SUV like so many others but, as it costs so much to build, it’s only available in left-hand drive which will be a put-off for many UK customers. Despite the cutting edge technology, it’s also not quite as modern as you might expect. Introduced in 2009, the ix35 was a step forward for Hyundai in the UK, but it has since been replaced by the Tucson and that shows how far ahead the game has moved. Before heading off, we needed to refuel. It’s not a complex procedure but it’s not quite as straightforward as sticking a nozzle in a hole at your nearest forecourt. The hydrogen nozzle itself is heavy, but clicks into place reassuringly. Once it’s attached to the car, you leave it alone while the pump checks that everything is ok. Once it is, the flow of liquid hydrogen begins before a worryingly abrupt stop. ‘Fear not’, my guide tells me. Because hydrogen is cold, seriously cold, the pipes and connections can freeze. The pump stops to check connections once again, and ensure there are no leaks, which is a good thing. Once a few kilogrammes of hydrogen have been pumped in (no litres here), the nozzle unclips and you simply return it to the pump. When stationary, it's entirely silent, making that time rather less irritating than it could have been. With the digital display on the dashboard now showing a range of around 430 miles, it was time to hit the M25. And then stop, because this is the M25. Edging forward a few feet at a time, one of the car’s biggest plus-points became apparent; it’s silent. Literally entirely silent, making that time spent stationary rather less irritating than it could have been. ‘Like in a normal electric car?’, you may ask. Yes, exactly. 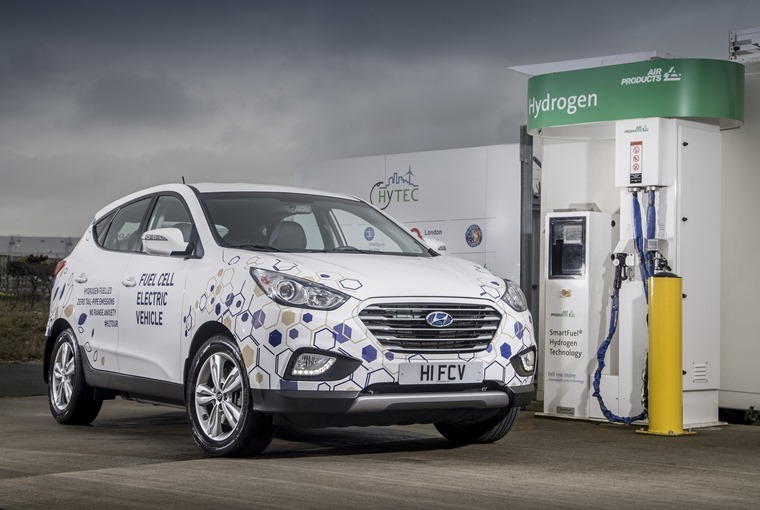 While the ix35 is fuelled by hydrogen, rather than going into an engine like petrol does, this goes into a complex box of tricks that uses chemical reactions to extract electricity. That electricity then goes to a motor to drive the car, just like a normal electric car. That process produces a little bit of waste though, but it’s not harmful - only pure water escapes the tailpipe in the form of steam. Finding a way through the traffic, I’m eventually on the move and finally reaching proper motorway speeds. At 70mph, it feels just like any other car; the motor is inaudible (although that’s mostly down to tyre noise drowning everything else out) and it handles just like an ordinary SUV. Every now and then, a cloud of steam wisps around into view in the wing mirror, reminding me that I’m driving something special. How special? Well, £53,105 for an elderly mid-sized SUV isn’t great value, so that suggests just how valuable the fuel cell technology is. The only way for that price to come down is through volume, and therein lies a problem; with no fuelling infrastructure to speak of, the cars remain impractical. At least 65 filling stations are required to make the cars viable; the big question is ‘who pays?’. The manufacturers feel that Government should pay, but the Government doesn’t appear to be too interested in hydrogen with electric vehicles and plug-in hybrids being the focus for now. There is a simple answer to this, but one that the manufacturers don’t like. The three main parties with hydrogen products, Hyundai, Honda and Toyota, turned a combined profit over the last year of £8.7 billion. Spending 0.7% of that on infrastructure would allow the technology to thrive, but nobody is prepared to make the first move. Until somebody, anybody, puts their hand in their pocket, hydrogen cars such as this excellent ix35 will remain expensive novelties. At least the Hyundai will be a record-holding novelty. After pounding around the London Orbital some 50 times, and with a few runs up and down some other roads for good measure, the ix35 travelled 6,096 miles, beating the existing record by 72 miles. Or just over half a lap of the M25.